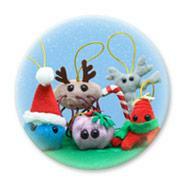 Welcome to TMG: GIANTmicrobes: It's What Should Be Under Your Christmas Tree! GIANTmicrobes: It's What Should Be Under Your Christmas Tree! They are- ok well the name is also the description so I'll have to take this review in another direction. Ever want to show a child what let's say a blood cell looks like so you google it. There pops a picture ok great. Well with GIANTmicrobes you can not only show them, you can have them hold a red blood cell plush that is only about a million times the size of the actual cell-bonus it's cute as heck too. The plushes are soft and well-crafted and look like the actual cell or virus in question with the bonus of black eye buttons. They are great for education- as visual tools for projects and learning or for pelting each other with the common cold when your kids aren't looking. A great teacher gift is the sick day box set! Which is just as adorable! Filled with the common cold, cough, ear ache sore throat and cavity, something every teacher is acutely aware of. I also like to use this kit as an anger release and laughter generator when X is sick! Let’s say X has an earache- man does he not handle ear aches well. Well I give him the ear ache giant microbe and he flings it, stretches it, yells at it, and has the cat play with it. Seems silly I know but by the time that toy reaches the cat X is no longer crying but cracking up that he is playing with his ear ache! I swear nine out of ten times this is the key to getting my kid laughing while he is sick! Love these things! Available Online for $24.95 on sale now for $19.99! What I really love about these toys though is giving them to germaphobes. I gave the Christmas bundle for my sister in law a few years ago who has "antibacterial" as her middle name and I thought it was the-funniest-thing-ever. To her credit she laughed a lot as well (one of the few times that that happened lol). This year there are three different Christmas themed gift packs, A Christmas wreath, Christmas tree, and a Christmas Stocking-which is what we received! This gift set includes "Penicillin, Salmonella, Red Blood Cell, Dust Mite and limited edition Green Amoeba". They are all dolled up in there Christmas best, and have embroidery! Festively adorned with decorative puffs, embroidered holly, snowflakes, reindeer nose and antlers, and cute scarf and ear muffs! The red blood cell has snowflakes, holly adorns Samonella, but my favorite is the Dust Mite that is all dolled up as Rudolph!. If it was possible to make these little guys cuter, they just did it. I love them. Yes germs are gross- viruses stink- and a computer virus can bring a grown man to tears. But even though these are real life problems isn't it great to have a product that not only educates, but can make you laugh about it! So while shopping for a truly unique gift make sure you check out GIANTmicrobes. They have a variety of wonderful products that will make you laugh, and make YOU the ultimate gift giver this holiday season! *We were given products to review all opinions are our own!